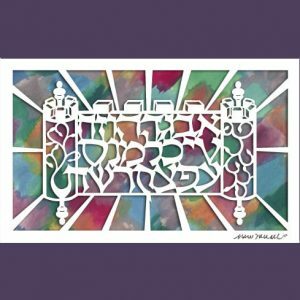 Categories: For Parents and Grandparents, Gifts for Community Leaders, Gifts for the Jewish Home, Great Gifts for the Holidays!, Israel-Holy Land Papercuts, Jewish Wedding Gifts. 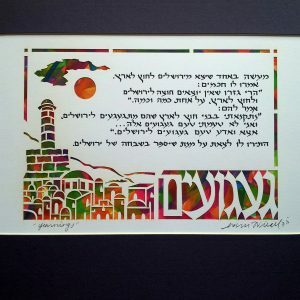 Tags: Israel, Jerusalem of Gold, Marci Wiesel, Papercut Judaica, Prayer for Those Who Dwell in the Land of Israel. 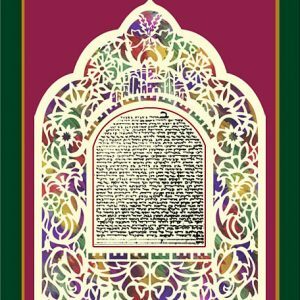 The design for this papercut, so lovingly created by Marci Wiesel, brings to life the Prayer for Those Who Dwell in the Land of Israel. This Hebrew papercut expresses the beauty and richness of the Holy Land while embodying the age-old hope to return to the Land of Israel. Bold colors and a rich design, depicting the seven special fruits of Israel, native flowers and the theme of Jerusalem of Gold, all come together to illustrate this heartfelt prayer. 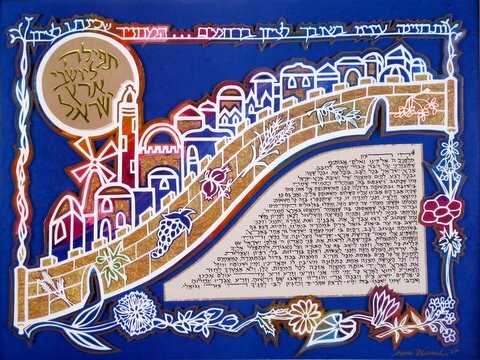 A true Jewish artwork by Marci Wiesel, all the themes are connected together through the Torah, which illuminates the world and stimulates constant growth of the Jewish nation. The text of the prayer was found in Bigdei Yesha, by Tzadok HaRofeh, Jerusalem, 5648 (1888). 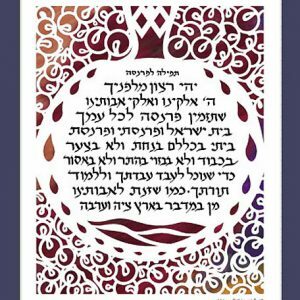 This Judaica paper cut is also available with the text of the Prayer for the State of Israel. Bathe my spirit in the holy light of the heavenly Eretz Yisrael so that I may grow in sanctity until I merit seeing the glory of the Lord with all the people of Israel. May I merit living in this Land, immersed in Torah and divine service praying without the distractions of this world. Enable me to do Your will with alacrity, without weakness or laziness, to embrace at least this one of the 613 mitzvot with great fervor. As our rabbis said, “Anyone who does even one mitzvah fully, benefits much, enjoys long life, and inherits the Land.” And, through this one mitzvah will I merit all the others.